until stage 13. The mechanism that controls the formation of the karyosome is not known, and no karyosome-specific proteins have been found so far. The chromosome-centrosome passenger protein, CP190, tends to accumulate in the oocyte nucleus, but seems to be excluded from the karyosome (86) (see Fig. 4H). The meiosis I spindle, being anastral and noncentrosomal, is rather unconventional, particularly regarding spindle assembly and the establishment of bipolarity. The karyosome may act like an initial MTOC, organizing microtu-bules into a bipolar spindle through the coordinated action of microtubule motors and microtubule-associated proteins (87). Similar kinds of spindle organization have been observed in chromatin-driven, in vitro spindle assembly assays using centrosome-free extracts (88,89). Whereas Drosophila proteins mediating the establishment of spindle bipolarity have been identified, those involved in a karyosome type of MTOC remain unknown, leaving unanswered the question of how microtubule nucleation occurs. Two microtubule-associated proteins, D-TACC and Msps, cooperate with the minus-end-directed microtubule motor Ncd to promote the assembly of the meio-sis I spindle (90). A fourth protein, NOD, with a predicted plus-end-directed microtubule motor activity, is localized along the chromosome arms, and is proposed to push achiasmate chromosomes away from the poles, forcing them toward the other chromosomes in the metaphase plate (91). 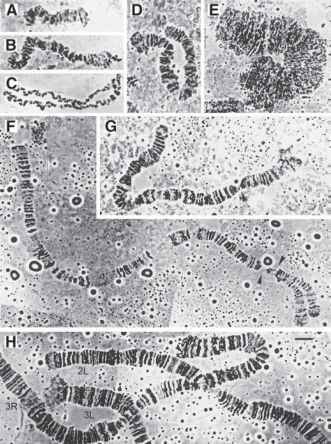 Full metaphase I is reached at the end of stage 13D, and meiosis I remains arrested throughout stage 14 (92). Just how this metaphase arrest is maintained is still an open question. The moment the egg is released from the ovary and passes into the oviduct (ovulation), the metaphase arrest is abolished and meiosis I proceeds into anaphase (92). Studies on fixed specimens revealed the chromosomes' behavior upon spindle activation to include (1) release of chiasmata and abolition of homologous pairing, (2) abolition of sister-chromatid cohesion along the chromosomal arms, (3) lengthening of the spindle midzone, and (4) transition from meiosis I to meiosis II without daughter nuclei formation (84,93). Elegant studies of stage 14 live oocytes have shed light on the dynamics of the meiotic spindle after oocyte activation by monitoring the spindle-associated Ncd motor protein tagged with green fluorescent protein (GFP) (94,95). Meiosis II is governed by a unique type of spindle apparatus that appears to be an elaboration of the meiosis I spindle (93-96). The midzone of the meiosis I spindle appears to differentiate into an MTOC by recruiting centrosomal proteins like Y-tubulin, CP190 and Abnormal spindle protein (ASP) (93,96,97). 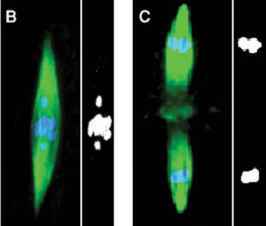 This newly formed MTOC serves as a central pole for the twin meiosis II spindles (see Fig. 5C). During metaphase of meiosis II, the kinetochores of the chromosomes are reoriented with respect to the new poles and, subsequently, segregation of daughter chromatids takes place (93). Upon completion of meio-sis II, four haploid nuclei, called polar body nuclei, form in the egg, and inside the polar body nuclei, the chromosomes begin to decondense (98). The time required to complete both meiotic divisions is estimated at approx 5-10 min (94-96). Insemination of the egg occurs while anaphase I is still in progress, and both anaphase I and all subsequent meiotic stages proceed identically in unfertilized and fertilized eggs, indicating that spindle activation is independent of fertilization (96,98-100). The equal distribution of chromosomes during meiosis I and II is dependent on the maintenance of sister chromatid cohesion (101,102). At the onset of anaphase I, the chiasmata of homologous chromosomes (referred to as tetrads or bivalents) are released, so that each pair of sister-chromatids (now referred to as dyads or univalents) can segregate to the opposing spindle poles. At the same time as chiasmata are released, the cohesion that holds the sister-chromatid arms of each dyad is similarly abolished. The centromeric cohesion of each dyad is then maintained until the onset of anaphase II, at which time it too is abolished. Thus, during meiosis, chromosome segregation is mediated by two mechanisms at the level of chromosomal cohesion. Drosophila proteins responsible for the cohesion of paired homologous chromosomes remain unknown, but they likely include some of the same cohesion proteins that hold together the arms of sister chromatids. At least two Drosophila proteins, encoded by the mei-S332 and ord genes, are implicated in centromere cohesion of the dyads (103,104). The oocyte nucleus can be easily visualized by staining with anti-lamin antibody using the method described in Subheading 3.4. The karyosome can be counterstained with nucleic acid dyes like TOTO-3 or propidium iodide. Analysis of the meiosis I spindle by immunostaining requires special sample preparation and fixation conditions to avoid premature activation of the oocyte. It has been observed that hydration in hypotonic (diluted) Robb's medium (105) induces physiological changes in oocytes that resembles the normal activation by ovulation (106,107). The immunostaining method of Theurkauf and Hawley (87) is based on a prefixation that makes use of normal (undiluted) Robb's medium; therefore, activation of the meiosis I spindle is avoided. Although, this protocol works reasonably well with some antibodies, it requires mass isolation of oocytes. An alternative immunostaining method uses oocytes obtained from females hand-dissected in methanol (108). This methanol-based method has produced excellent results with several antibodies (90). A methanol-based method is presented in Subheading 3.5. To analyze completion of meiosis I and the meiosis II division, another methanol-based protocol can be used to fix 5- to 10-min-old eggs (96). A version of this method is described in Subheading 3.6. The dynamics of the meiosis I and II spindles can be imaged in live oocytes as described by Endow and Komma using Ncd-GFP transgenic lines (94,95), whereas the Mei-S332-GFP line of Orr-Weaver and colleagues can be used to follow chromosomes (103).